Automatic fail-over: which is helpful for the unexpected master failure, crash, … etc. (the fail-over can be done also manually). Fast online master switching: which is helpful when performing the regular planned or scheduled maintenance operations like kernel updates, MySQL upgrade, HW upgrade, … etc. Make sure that no slave lagging problem and all servers are at the same point. Promote one of the slaves (slave1) to be a new master. Point the other slave (slave2) to slave1 instead of master. Configure master to be slave for slave1 to get all updates which will happen during the maintenance. Stop MySQL service on master to perform the maintenance operation (kernel update “server restart”, MySQL version upgrade, .. etc). Start MySQL service on master and wait until getting all missing transactions from slave1. Promote back master to be the current master. Re-point slave2 to master again. Configure slave1 to be back as a slave for master. It’s not as simple as it appears, especially, if classic replication is being used because we will need to get the matched binary log file name and position between the old master and the new one to be used on the slave(s) in the re-pointing step to the new master! Also, it makes sense to use VIP on the top of the DB layer to be used by the application to avoid extra work from the application – or maybe downtime – during the fail-over process. So, we will need to do extra steps to remove/add the VIP from/to the demoted/promoted master! MHA can make such process pretty simple and easy!! Node package: Should be installed on all DB servers (the master and the two slaves in this example). Manager package: Recommended to be installed on a separate server but it’s OK to install it on any one of them (preferred not the master in case of the master failed e.g. slave1). MHA packages can be downloaded from here. Some Perl dependencies are required (DBD::mysql on all servers while Config::Tiny, Log::Dispatch, Parallel::ForkManager and Time::HiRes are required on the manager). No need to specify which server is the master as MHA detects it automatically. candidate_master and no_master options are needed only in the fail-over as in the online master switching we will specify the new master host. Copy the scripts “master_ip_failover” (will be executed when performing the fail-over) and “master_ip_online_change” (will be executed when performing the online master switching) from /sample/scripts to “/etc/mha/” and make sure they are executable (you can copy only the one you plan to use). The message “All SSH connection tests passed successfully” should be printed at the end, otherwise, something wrong should be fixed first. The message “MySQL Replication Health is OK” should be printed at the end, otherwise, something wrong should be fixed first. Once the manager failed to connect to the master three times (you might need to configure secondary_check_script to make sure it is not a network issue) it will change the master automatically and stop monitoring. shutdown_script should be used to power-off the master to make sure it is really down and to avoid split-brain. It is recommended to double check the SSH connectivity and replication health also directly before switching the master using masterha_check_ssh and masterha_check_repl scripts. MHA will execute “FLUSH TABLES WITH READ LOCK;” after freezing the writes on the master. Using --orig_master_is_new_slave option will make the master slave for the new master after the switch process. SSH checking is not successful!! Host-names with its IPs are added to /etc/hosts ?? Remote root login is permitted ?? “PermitRootLogin yes” in /etc/ssh/sshd_config (sshd should be restarted after that change)! Don’t forget the self referential!! Replication checking is not successful!! Binary logging is not enabled on the candidate-master slave?! Binary logging is enabled on any of the slaves but the replication user is not created there ?? MHA will consider any slave having bin_log enabled as a candidate master in the replication checking. So, either we have to disable bin_log on all slaves except the candidate master or create the replication user on all slaves having bin_log enabled. Filtration rules are different on the slaves? It should be the same on all slave servers! binlog path is different? consider adding master_binlog_dir in app1.cnf! Same with pid file path, mysql port, mysql client bin dir, … etc. if they are in different paths (full parameter list can be checked out here). Master/Master in active/active setup? (one of them should be read_only as only one active is allowed “active/passive”). MySQL user for MHA ? not enough privileges!! Slaves can’t connect to the new master! The replication user does not exist on the candidate master ? Changing the VIP to the new master is not being reflected immediately to servers in other networks!! “Gratuitous ARP” need to be sent after adding the VIP on the new master to update the arp table!! One manager can manage many systems! I.e. app1, app2, … etc. and it is recommended to have one manager per data-center. Install node package on all MySQL servers. Install manager package on the manager. Create the needed scripts (app1.conf, master_ip_failover, .. etc.). masterha_manager for fail-over or masterha_master_switch for master switch. Having your system high available with no additional costs, no system or DB redesign and not in a complex way is possible with the opensource tool, MHA! Finally, thanks to Yoshinori Matsunobu for creating such wonderful tool!! So, what is the mhauser needed? According to the mha official site, there is no mention of creating a mhauser. 1- Checking the replication status (slaves are connected/started or not and maybe checking binlog is enabled in the candidate-master or not). 2- Issue “FLUSH TABLES WITH READ LOCK” and marking the master as read_only in case of the manual fail-over. 3- Kill the current transactions on the master – if not yet finished before the allowed time – before the failing over. 4- Check and apply the relay logs on the slaves if they were not yet replayed. 5- Issue the “CHANGE MASTER TO …” command on all slaves – maybe the old master as well – after promoting a new master. Is MHA compatible with MariaDB ? Yes, MHA 0.56 is compatible with MariaDB! Although it supports MySQL GTID but it does not support MariaDB GTID as it has different implementation. I’m using MHA 0.57 with GTID based replication. If I use masterha_check_repl, mha says that all SSH checks will be skipped but in the next line it says that it will check SSH publickey authentication settings on the master. Why is that? Is SSH needed in GITD based failover scenarios? Generally, you can do the load balancer changes instead of the VIP parts in the MHA scripts but it depends on the Load Balancer you are using. E.g. in HAProxy, you can add a second server for the write requests as a backup to be used by default when the main master fail. In that case, MHA should be configured only to restructure the replication. I believe there are 3 main users in the MHA setup and the mhauser’s role has been clearly defined here by Moll. What about the ssh_user and which user does the ip vip failover because I can into a situation where the vip would not move when the ssh_user was not root but had sudo privileges. I ended up with Permission denied. I have observed that during a manual switch master_ip_failover_script is not called. However, VIP failover works just fine during automated failover. Is this by design? If so, why? If not, can I activate VIP failover some how? When you do a manual master role switching the master_ip_failover_script is not being executed but master_ip_online_change! Thanks a lot for the tip. I will try that out. I’m using MariaDB 10.1.21, with the mha 0.56. I tried everything, and it showing the below error. Fri Jul 14 06:18:52 2017 – [error][/usr/share/perl5/vendor_perl/MHA/ServerManager.pm, ln492] Server 10.16.14.224(10.16.14.224:3306) is dead, but must be alive! Check server settings. Fri Jul 14 06:18:52 2017 – [error][/usr/share/perl5/vendor_perl/MHA/MasterMonitor.pm, ln523] Error happened on monitoring servers. Fri Jul 14 06:18:52 2017 – [info] Got exit code 1 (Not master dead). Can you help on fixing this? ps: MySQL replication is working fine. It looks to me like the problem is related MHA can’t connect to that servers. Are you sure the MHA DB user can connect to that server from the MHA manager? If you are using different settings than the defaults, like datadir, port, … etc. you should specify that in the MHA configs as well. 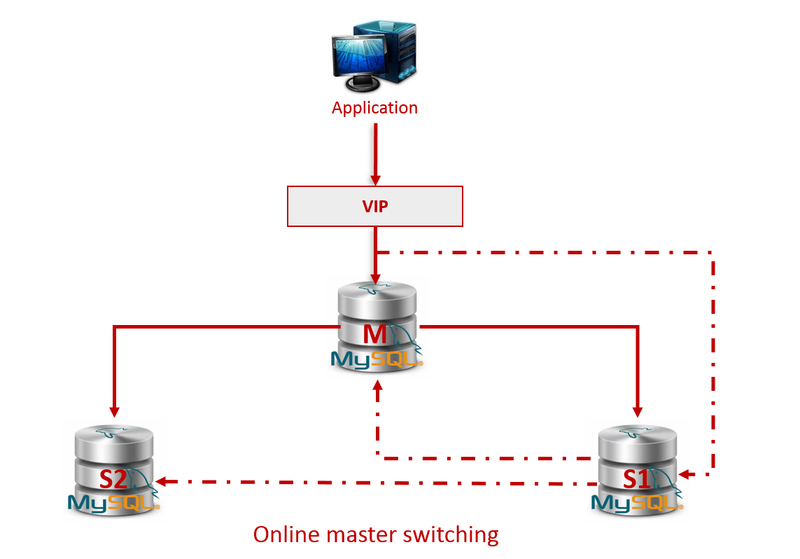 Is it possible for two mysql server one is master and second is slave ? where we can download rpm for MHA. I was unable to locate mha 0.56 rpm for mariadb. Looks like 0.56 is not there anymore! I tried everything, and it showing the below error. Tue Nov 21 06:27:31 2017 – [warning] Global configuration file /etc/masterha_default.cnf not found. Skipping. Tue Nov 21 06:27:31 2017 – [info] Reading application default configurations from /etc/app1.cnf..
Tue Nov 21 06:27:31 2017 – [info] Reading server configurations from /etc/app1.cnf..
Tue Nov 21 06:27:31 2017 – [info] MHA::MasterMonitor version 0.55. Tue Nov 21 06:27:32 2017 – [error][/usr/local/share/perl/5.22.1/MHA/MasterMonitor.pm, ln386] Error happend on checking configurations. Redundant argument in sprintf at /usr/local/share/perl/5.22.1/MHA/NodeUtil.pm line 184. Tue Nov 21 06:27:32 2017 – [error][/usr/local/share/perl/5.22.1/MHA/MasterMonitor.pm, ln482] Error happened on monitoring servers. Tue Nov 21 06:27:32 2017 – [info] Got exit code 1 (Not master dead). Tue Nov 21 07:26:03 2017 – [warning] Global configuration file /etc/masterha_default.cnf not found. Skipping. Tue Nov 21 07:26:03 2017 – [info] Reading application default configurations from /etc/app1.cnf..
Tue Nov 21 07:26:03 2017 – [info] Reading server configurations from /etc/app1.cnf..
Tue Nov 21 07:26:03 2017 – [info] Starting SSH connection tests..
Tue Nov 21 07:26:03 2017 – [debug] Connecting via SSH from root@192.168.31.109(192.168.31.109:22) to root@192.168.31.110(192.168.31.110:22)..
Tue Nov 21 07:26:03 2017 – [debug] ok.
Tue Nov 21 07:26:03 2017 – [debug] Connecting via SSH from root@192.168.31.109(192.168.31.109:22) to root@192.168.31.107(192.168.31.107:22)..
Tue Nov 21 07:26:03 2017 – [debug] Connecting via SSH from root@192.168.31.110(192.168.31.110:22) to root@192.168.31.109(192.168.31.109:22)..
Tue Nov 21 07:26:04 2017 – [debug] ok.
Tue Nov 21 07:26:04 2017 – [debug] Connecting via SSH from root@192.168.31.110(192.168.31.110:22) to root@192.168.31.107(192.168.31.107:22)..
Tue Nov 21 07:26:04 2017 – [debug] Connecting via SSH from root@192.168.31.107(192.168.31.107:22) to root@192.168.31.109(192.168.31.109:22)..
Tue Nov 21 07:26:04 2017 – [debug] Connecting via SSH from root@192.168.31.107(192.168.31.107:22) to root@192.168.31.110(192.168.31.110:22)..
Tue Nov 21 07:26:05 2017 – [info] All SSH connection tests passed successfully.